Four years ago, in February of 2010, we buried my paternal grandparents. Pawpaw passed away on February 9th and Grandmommy on the 18th, just nine days later. It was emotionally devastating, surreal, and beautiful. My grandma had been suffering from a ten year battle with dementia. The first couple of years we didn't even realize she was losing her memory; Pawpaw was pretty good at hiding it. I remember the afternoon we were visiting and my parents saw a medicine bottle on the table, the surprise and worry on their faces. While at first it wasn't very noticeable, Grandmommy's dementia grew more and more apparent over the years. Pawpaw continued to hide the severity of it; he was determined to live at home and take care of them both until the end. 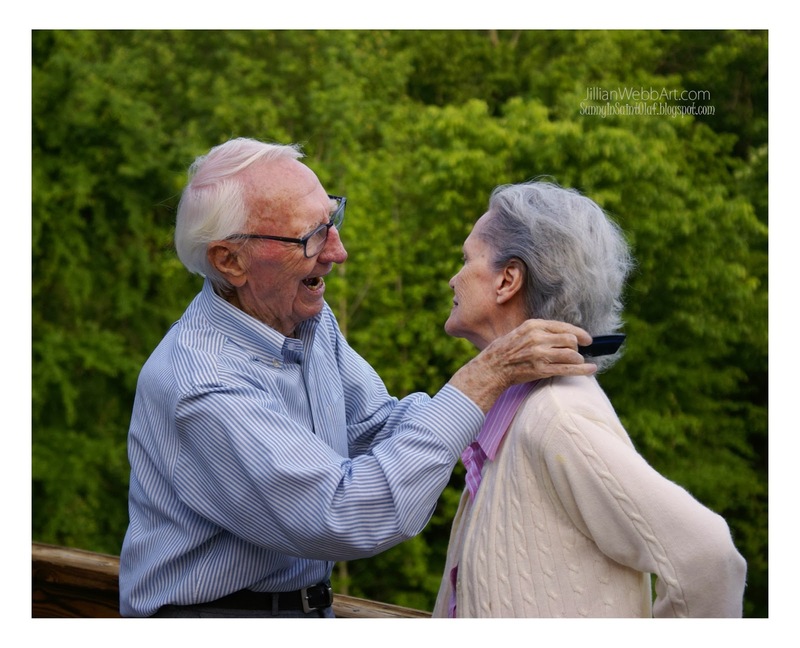 He had cared for her through her battle with colon cancer, pancreatitis, a mastectomy, her eyesight weakening until she was legally blind, and through her struggle with dementia. He would help her put on her makeup, pick out her clothes, and he brushed her hair. He took over all of the cooking, grocery shopping, laundry, and cleaning. He helped her bathe and he held her hand to keep her steady. 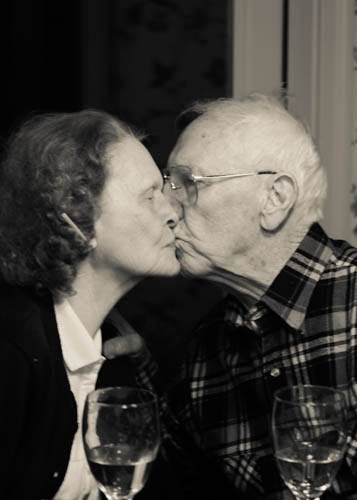 We had no idea how much all of his caregiving had escalated, but with an unselfish wholehearted love, he cared for her. He lived for her. Numerous times over the last ten years of her life, we feared she would not bounce back, but she always would. The last few years, her dementia became more obvious and she mostly sat quietly in her favorite chair when we visited. Every once in a while we were able to coax her to the piano and were amazed that she was still able to play with grace and fluidity. Some days she would know us, but many she didn't. It wasn't an easy lifestyle for Pawpaw; I'm sure there were days he was bored out of his mind and days he was completely drained of energy, but he was determined to care for them at home. We tried to talk him into an assisted living center or moving to be closer to us. My parents even tried to have them move into their house, but he wouldn't budge. My parents and my aunt and uncle finally talked him into having a nurse come by a couple days a week to help out. Then, on a cold winter day, Grandmommy fell and broke her hip. She was taken to the hospital, where they did an excellent job with her partial hip-replacement and transported her to a nearby rehabilitation center for her to recover. While she was in the hospital and rehabilitation center, Pawpaw drove back and forth to stay with her. She progressed well and the doctors were impressed with her recovery. She was bouncing back yet again! All Pawpaw could think was, how and when do I get her home?! One day while Pawpaw was home alone, he called my uncle and parents and said it was time to talk. While they thought he was ready to talk about moving into an assisted living arrangement, he had other worries on his mind. The severity in his voice frightened them. What we soon found out was that Pawpaw wasn't just good at hiding my Grandma's battles; he had hidden his own as well. We had no idea that he had been having trouble breathing, my Uncle took him to the doctor and he was immediately sent to the hospital. He had pulmonary fibrosis of the lungs and it was progressing quickly. He was rushed into ICU and the doctors were doing all they could. For awhile he stayed in the hospital fighting for his life and longing to be with Grandmommy. After researching his condition, we knew the only hope was a lung transplant. We knew that he wouldn't get a lung transplant, but Pawpaw asked for one anyway. The doctor laughed. I think the shock of hearing a 93-year-old man ask for a lung transplant caught him off guard. He clearly did not know my Pawpaw! When the doctor realized he was serious about the lung transplant, he had to explain how there was a waiting list and how the surgery was a really tough surgery to get through at any age. Quite simply, the lung transplant was not an option. The best case scenario, we get his oxygen levels up and take him to the rehabilitation center. By some miracle he made it out of the hospital and into the room at the rehab center with Grandmommy Dixie. I remember the lump in my throat when I walked into that room for the first time and saw their names printed side by side on the door. At least they were together. Mom thinks this is when he realized, Grandmommy would probably never get to go home again. He remained determined but took a turn and had to be readmitted to the ICU. His lungs just weren't absorbing enough oxygen. We couldn't wrap our heads around the doctor’s prognosis, Pawpaw was strong and healthy and would live to be in his 100s! He was a fighter. Later that day as I sat near the window and watched my dad and uncle talk to Pawpaw, we witnessed him shoo away something with his hand. As crazy as it sounds, he said it was a little boy that kept coming to his door. Children were not allowed in the hospital due to flu season and there wasn't anyone in the room or at the door; we were sure we had just witnessed him wave off an angel. As we took turns spending the night at his bedside, giving him ice chips and keeping him comfortable, holding his hand and telling him he was gonna beat this, there was a small part of each of us that really believed he would bounce back, that the doctors didn't know what a fighter he was. Pawpaw's only goal was to get better and get back to Grandmommy. Over the past several months her dementia was so bad she barely spoke, and after Pawpaw was taken back to ICU, away from her, it only worsened. When she did speak she only said one word: "Roy." I was with Pawpaw in the hospital room and my Dad was visiting Grandmommy at the rehab center and we called each other on speakerphone. Not knowing if she would respond, I held the phone up for Pawpaw and helped him pull off his oxygen mask. He said, "Dixie," and she heard him. She responded, "Roy!" and they both said "I love you." Those were the last words they said to each other and it was the most beautiful conversation I have ever heard. It wasn't long before an end-of-life care worker came to talk to us about Pawpaw. She recommended moving him to Hospice. You can't even imagine how devastated we were, how many emotions went through my head and my heart. My aunt and uncle were there when they transported Pawpaw to the Hospice center on February 9th, 2010. They had him in his room and he was given a prayer shawl while they were finishing the check-in process. Before they could finish checking him in, he was visited by another angel and this time he left us. My aunt couldn't see the "man" he spoke of in the room with them, but she believed him. We all did. Over the next couple of days, the funeral plans were made and my parents contacted the few surviving relatives to let them know that he passed away and funeral arrangements. When they spoke to Grandmommy's sister-in-law, Martha, there was surprise and shock in her voice. She asked when he had passed, because a few days earlier, Bill, my grandma's brother who was also having health problems, asked Martha out of the blue how she thought Dixie and Roy were doing. She shrugged and said, "Just fine; they're down in Charlotte." He sat up and said, "Roy was just here." Seemed like an awfully strange coincidence! 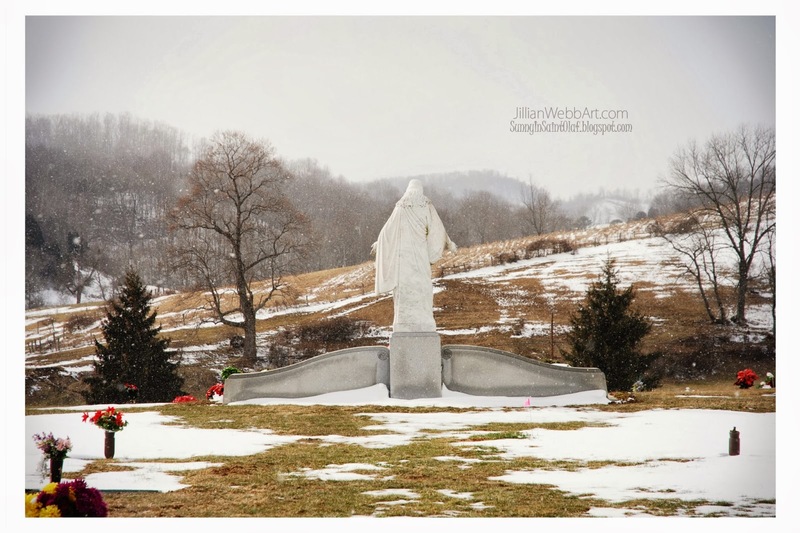 Our immediate family drove to Saltville, Virginia, to lay our valiant Pawpaw to rest alongside our ancestors. There was snow on the ground and the countryside was magnificent. It was the first time I ever thought a graveyard was beautiful. I remember that a few other relatives came to the funeral and that the ground was wet. I remember that the furniture in the funeral home looked like an antique piece I had gotten from my parents; maybe it was from the same area. I remember standing over the casket and looking down at this worldly vessel that carried my grandfather's spirit through 93 earthly years. I remember feeling that his body was there but that his spirit was freed. We hadn't decided if anyone would tell Grandmommy that Pawpaw passed away.We worried it would set her back or that the news would possibly kill her. We didn't have to tell her; she knew. The rehabilitation nurses informed us she had suddenly quit eating and that her health was quickly fading. There was mention of feeding tubes and life support but we already knew those weren't her wishes. The staff kept her comfortable and in a few short days she left this world to be with Pawpaw. After sixty-four years together, not even death could keep them apart. We made her funeral arrangements and quickly informed the few relatives we had seen just the week before. I remember driving back to this now-familiar place. I remember the presence of an old friend that no one recognized, and the mixed emotions it gave my father when he realized who he was. He had been a boyfriend from Grandmommy’s youth, come to pay his respects. His presence made me imagine my grandmother as a young girl before she married my Pawpaw, a time in her life that I never really thought about. When I looked into the casket over her petite 90-year-old frame, I had the same feeling I had looking down over my Pawpaw the week before. I remember a different kind of peace. I remember feeling relieved for my Grandmommy, no longer trapped by her mind and free, reunited with my Pawpaw. I struggled for weeks, months even, after their funerals. I struggled with sadness, loss, and the realization that we are not in control. I finally realized that we don't always need to be in control. We just need to have faith, do our best to do the right thing, and to love. We cannot control many of the things that happen to us, but we can react with love. We cannot control how people treat us, but we can respond to them with love. We cannot control life's twists and turns and there will always be ups and downs. Life is mysterious. It is sad and happy, and it is beautiful. I wholeheartedly believe we are on this earth to learn how to love: to learn true love, unconditional love, give-your-life-for-someone kind of love. 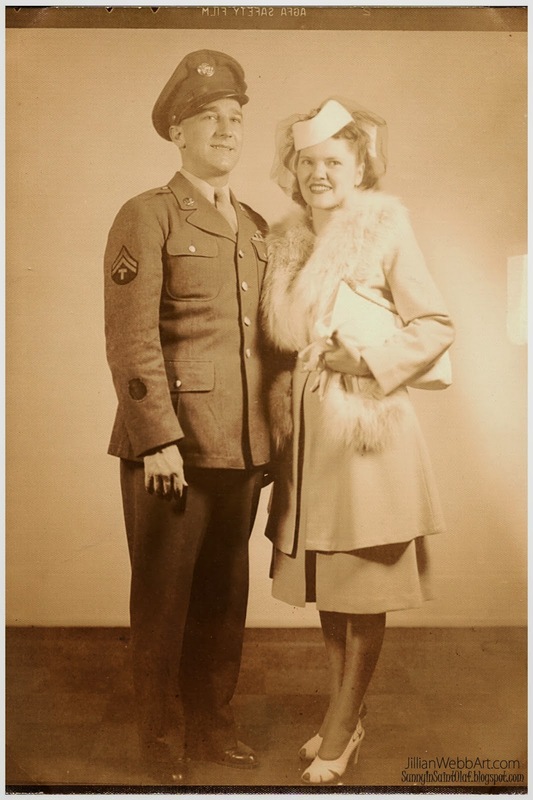 We always thought Pawpaw was living for Grandmommy... he who lived through the Great Depression and the trenches of WWII, who fought for a lung transplant when he was 93, who was gonna take care of his bride no matter the cost. In the end I saw... she was living for him, too. Four years later, I still miss my grandparents, but I feel forever connected to them. I'll always cherish the memories and be thankful to have witnessed their amazing love story. This week for Grampa's 87th birthday, I made my first chocolate buttercream cupcakes. I had a box of Pillsbury chocolate cake mix in the cupboard (shhh.. I cheated a little) but no canned icing! Yep, I've used the canned icing before in a pinch. So after some quick research on homemade buttercream, I decided to try making my own chocolate buttercream from scratch! While I was slightly nervous, because I never know how my baking will turn out, these cupcakes were fantastic!! WOW- homemade chocolate buttercream is AMAZING! I can't wait to try other flavors! Not only were these the most gourmet tasting cupcakes I've ever made, they were the most professional looking cupcakes too! That's because I finally used my Pampered Chef easy accent decorator! One day I'll do a post to share all of my favorite Pampered Chef products, thanks to Kelsey, Jamie, Marty, and Beth for hosting that awesome shower for me, and to all those who participated! ♥ I digress..
After sampling a cupcake, making sure they were good enough to share, I packed up a tray full and a few spare. I dropped off a couple at Zach's work in town and we stopped to give his Grandma one on our way to Strawberry Point. You should have seen the excitement on Grampa's face when we opened the container full of chocolatey goodness! The best part about the day wasn't that my cupcakes turned out better than I could have imagined, it was watching Grampa feel excited and special as he opened his presents and ate his birthday cake. I know he enjoyed every chocolatey bite but I think he enjoyed our conversation and company most of all. After searching and searching for a stylish light fixture, I realized that my taste was quite expensive. In fact, most all light fixtures are expensive. 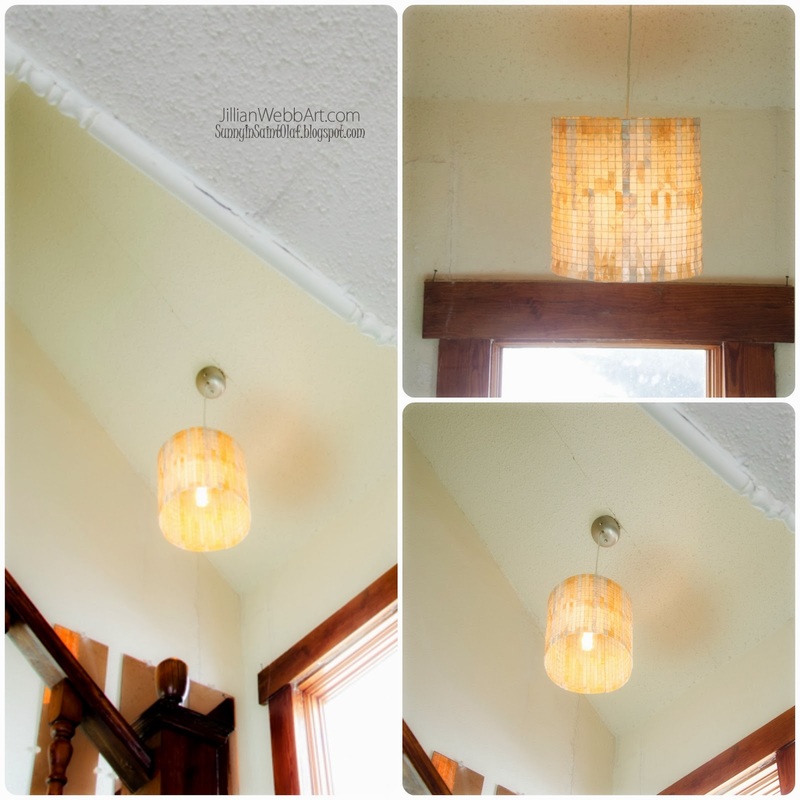 However, as I was looking for ideas, I came across several people on Pinterest and Etsy who made their own light fixtures. So, with a small budget and plenty of time on my hands, I figured making my own would be the best option. I knew I wanted to make something modern and elegant that would still fit in our 100-year-old farmhouse. I also wanted to use materials that are easy to come by and inexpensive. l love the simple lines of pendant lights and lamp shades and decided I could probably create that shape from wire cloth, which happens to be readily available in our small farm town. In my research, I discovered several people online who used coffee filters for lampshades and projects. I even found one artist who sells her beautiful coffee filter lampshades out of NY, she's amazing. After making my own knock off version of her coffee filter art, I definitely feel she deserves every penny for the time it takes to make one! While this project was quite time consuming, I sure do love my new light fixture! After painting, drying, and cutting my coffee filters, it was time to shape my wire cloth and begin the weaving process. I mixed the golden and silver slivers in no particular pattern and with steady hands weaved them into the wire cloth. Next, I had to decide how to finish the edges. I ended up folding the edges under and sealing the shade with Mod Podge. The next piece to the puzzle, how was I supposed to attach the shade to my pendant kit? I decided to attach it with wire. Lastly, my handy husband helped me hang and install our new light fixture! 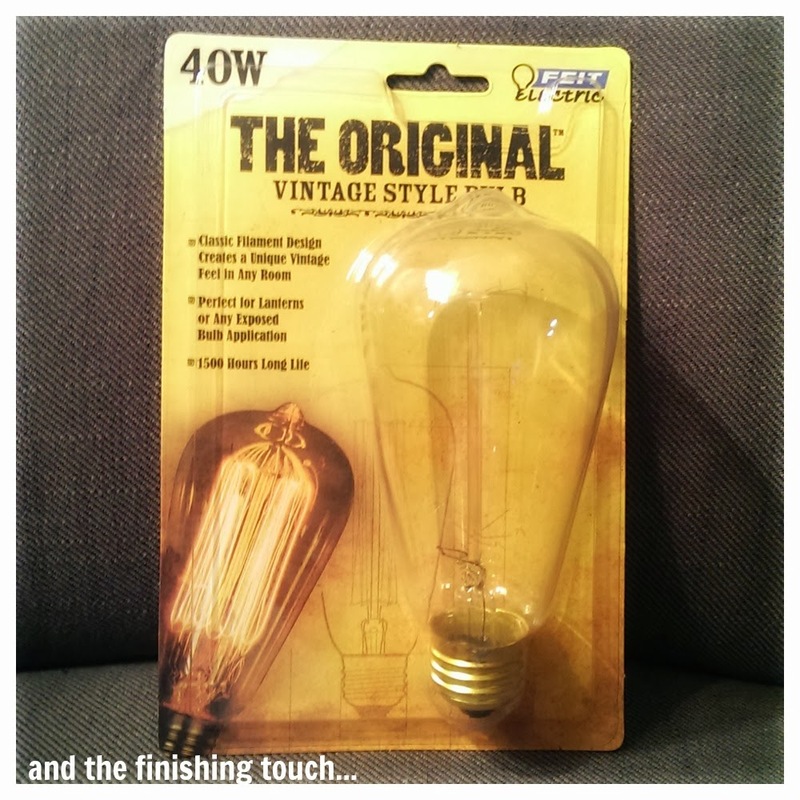 You've seen me use these vintage blubs before when I posted one of my first DIY farmhouse projects, Lamp Love! I love the warm glow of the vintage bulb through the shimmery shade. What kind of blogger would I be if I didn't share my Valentine's Candies? 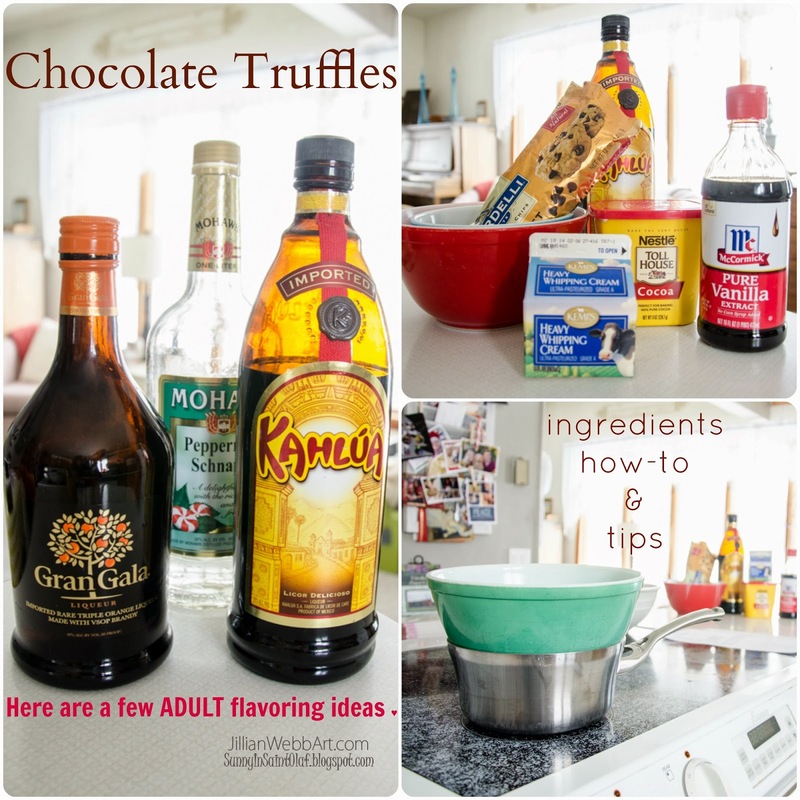 I stumbled across "Bailey's Chocolate Truffles" on Gimme Some Oven's blog earlier this week and thought they looked delicious. I decided I would use their recipe and make a few changes. Maybe I should have just stuck to the original recipe! 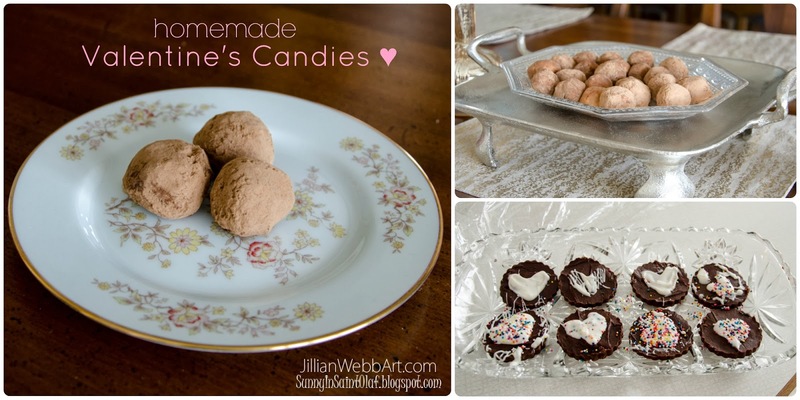 Anywho, here is my attempt at homemade Valentine's Candies! Obviously, I used 12oz of White chocolate for my White Chocolate Truffles. This recipe is easy to change-up according to your personal taste. For my second batch of candies, I switched out white chocolate and orange liqueur and used 12oz of semi sweet chocolate and Kahlua. 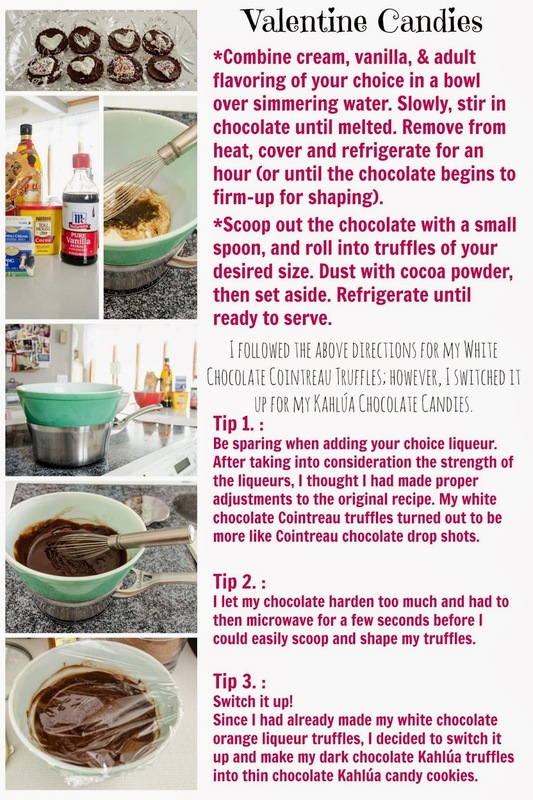 First, I poured the melted chocolate out onto a parchment paper covered cookie sheet. I put this in the refrigerator for a few minutes to slightly harden (I kept a closer eye on it this time around!). Then I used a round cookie cutter (I didn't have a heart-shaped one). I decided that I could make a small stencil out of parchment paper and drizzle melted white chocolate to create a heart on my candy. Again, here I go embracing imperfections! They turned out pretty cute! Aunt Jilly & Uncle Zachy cannot wait to kiss your cheeks in just a few weeks! Handmade Cards♥ customizable, creative, & cute! I made this birthday card on the computer using Photoshop. There are other programs you could use. Even older programs, like MS Paint, have text and drawing options. 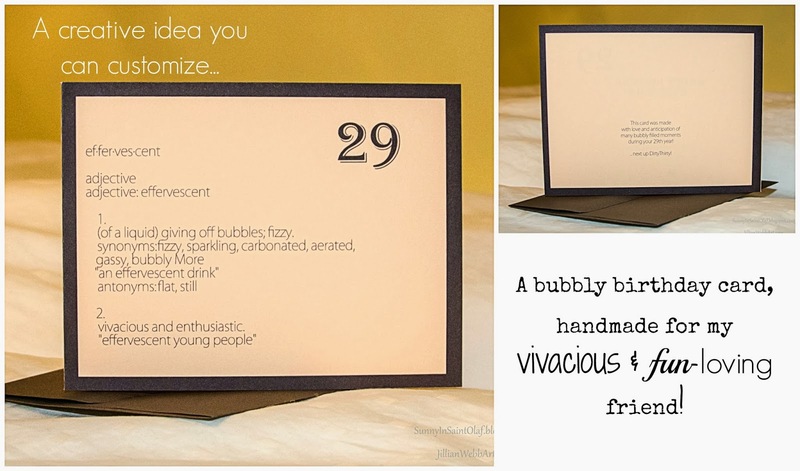 I used the word effervescent and its definition because I feel it is a happy celebratory word, which paints a youthful fun link between my friend's birthday and her vivacious personality. I also liked it because it's not a word that comes up in everyday conversation. With my friend's recent engagement, I am sure this birthday and year will be filled with celebrations and effervescent cocktails! For the most part, I try to make cards for special occasions. I love that they are personal, one of a kind, and can be an inexpensive way to share a heartfelt memento. Not to mention, it's an awesome way to make you feel like a kid again (depending on your card's subject matter and content of course)! 3. I don't have the extra time to make a handmade card. 1. That's what Pinterest is for! for the particular occasion or person. 2. It doesn't have to be frilly, embrace simplicity and imperfections! It's okay if it looks handmade, in fact, you want it to! 3. 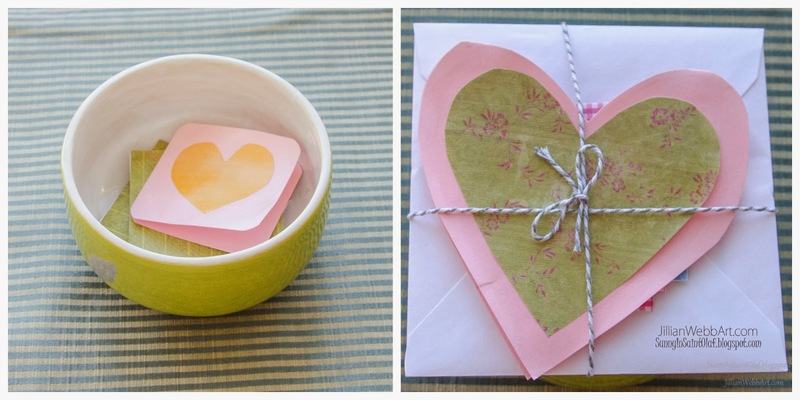 It can take 5 minutes or less to create your handmade card, less time than a trip to the store! Which is also much less time than it takes me to scan through and read all of the cards at the store. There are plenty of ways you can customize a handmade card to fit your own friends and family. I hope you'll take the challenge and have a little fun with your next birthday, anniversary, or congratulatory greeting! Feel free to share my posts with friends and family! A Super Bowl Sunday Snow Day!